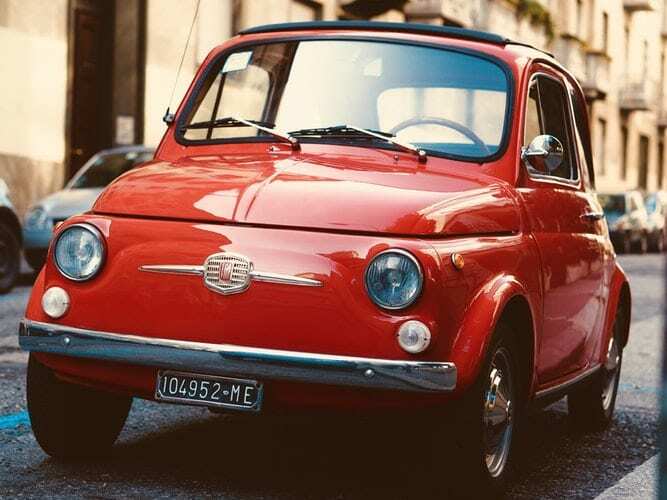 See the city and begin a journey to the past in this vintage car. During this 30-minute tour (“Fast Tour“*) you will see the heart of the city – the Sforza Castle, the Montenapoleone Luxury District, the Brera Art District, the Scala Opera House, Modern Art Gallery, Modern Art Pavillion, Royal Villa, Public Gardens and more. Tour available daily from 10 am. No stop for photo opportunities, No Hotel pickup. Alternatively, during 1-hour tour (“Slow Tour“*) you will see all mentioned above and more! Like Duomo, Royal Villa, Public Gardens, Santa Maria delle Grazie church with The Last Supper by Leonardo da Vinci, the Sant’ Ambrogio church, the Leonardo Science and Technology Museum, the Natural History Museum, Milan Roman Area and much more. One stop for photo opportunities. With the “Skyline Tour“* you will discover the old and the new city in 1-hour. From the classic heart of the city to the modern Garibaldi District. Hotel pickup (selected hotels only). Finish at Corso Como (Garibaldi District). Tour available Monday>Friday from 7 pm – Saturday, Sunday from 10 am. “Canals Tour”*: discovering locks, ports and canals by vintage car in 2-hours. You will see the City of water by Leonardo da Vinci!! Two stops for photo opportunities. Hotel pickup (selected hotels only). Finish at Corso Como (Garibaldi District). The “Central City Tour“* will shows You the city centre in 2-hours. La Scala Opera House, via Montenapoleone Luxury District, Belgioioso Royal Villa Belgioso, Brera Academy and Artistic District, The Sforza Castle and EXPO GATE , Triennale Art Museum, Branca Tower, Santa Maria delle Grazie – The Last Supper by Leonardo Da Vinci, San’t Ambrogio Church and “Pusterla”, Milan Roman Area, Codex Atlanticus, Duomo, via Torino Shopping Area, Viarenna Lock, Roman Amphitheater, Velasca Tower, State University, Law Court, Rotonda della Besana, San Babila Square/ Church and more! The “Night Tour“* is a 3-hours tour through the aperitif scene of “Milano da bere”. City tours (Conservatory, Law Court, Duomo, Velasca Tower, Santa Maria presso San Celso Abbey, Canals District with Darsena port, San Vittore Penitentiary, Triennale Art Museum, Arch of Peace, Chinese District, Monumentale Cimitery, Garibaldi Skyline District and much more! End at Corso Como. Three stops for photo opportunities. Tour available daily from 7 pm. *Tour route may be subject to variation depending on traffic condition, accidents, or city council recommendation.